Where a city lays its dead to rest says much about the living. 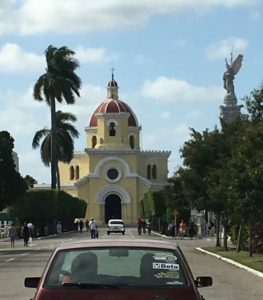 This past March, 2017, eleven graduate students from Pennsylvania and I visited two of Havana’s cemeteries: these cities of the dead set in stone a particular vision of the culture and history of the colonial and pre-1959 bourgeoisie on the island; one that reflects and reinforces the invisibility and neglect of the laborers that sustained the former. We started at the most monumental necropolis in Havana—the Colón Cemetery. Founded in 1876, the arrangement of the Colón cemetery is a physical manifestation of the social and political structures of colonial Cuba, eternalizing the hierarchies of pre-revolutionary society. At the same time, one sees in current burials manifestations of an ordering system that, although new, does not eliminate the stark status differences between the dead. The old adage, “Death is the great equalizer,” does not apply here. Aside from their cultural and religious significance, cemeteries are spaces whose ordering logic depends on pre-established societal inclusions and exclusions such as race and class. Originally a burial ground for Catholics—and even though it may now be more socially open—the Colón Cemetery still primarily welcomes its own: the descendants of the Catholic elite whose tombs may still be found at the center of the necropolis, as well as in the lower orders that radiate toward the grounds’ outer limits. In fact, there has been little room for inclusion at this cemetery. The Jews and Chinese, for example, had to find their own spaces since the 19th century. The layout of the cemetery provides a physical manifestation of the social hierarchies that order urban spaces for the living. Thus the wealthy elites were laid to rest along the cemetery’s main avenue, leading to the Church that forms the center of the necropolis. Like the wealthy parts of Havana, the necropolis’ main avenue shows off the wealth and status of its dwellers. One need only take a drive from the wealthy Western suburb of Miramar to the poor harbor suburb of Regla, across Havana Bay, to see in the city of the dead a continuation of the spatial order established in the city of the living. It is also there that those socially useful individuals—especially those who gave their lives in the service of this hierarchy—are rewarded with the honor of eternal rest among the elite. Yet this social classification of space ought not be understood as a simpleminded application of Marxist notions of class struggle, physically manifested. The cemetery also fractures the population along immigrant, regional and racial lines. Thus, there are designated sections for Gallegos and for Catalans, for example. Afro-Cubans, in turn, were relegated to the farthest points from the center of the cemetery—with the notable exception of a mulatto man who had the good fortune to marry one of the wealthiest white women of the time, and whose remains are also located in the main street of the dead. The ordering of the cemetery also reminds the visitor that money can lubricate reform of even the most rigid gender norms and family status facilitates whether rebellion against social norms is tolerated or not. Placed directly across from the most prominent monument within the main street of the necropolis is the monument designed by Rene Lalique to house the remains of Catalina Laso, one of the wealthiest, best connected, and scandalous women in Cuba of the first half of the 20th century. She left her husband and children to take up with her lover, with who she fled to France. In France, they were able to obtain a marriage annulment (at the price of separation from her children) that eventually helped usher in revision to the law of divorce in Cuba. In death as in life she managed to utilize her wealth not to overturn society, but to manipulate its practices to her own advantage—something that is reflected in the upscale architecture of her tomb, a reminder of the tastes Catalina and her lover developed while exiled in France: a marble tomb, with a rose carved in crystal and placed in skylights on a half-dome, and sculpted black granite doors. Popular saints might be more powerful than the Catholic-endorsed ones. Such is the case with one of the most popular tombs of the cemetery–that of “La Milagrosa.” Though not recognized by the Church, many people in Havana treat the woman buried there, together with her infant child, as a saint. And the saints of the 1959 revolutionary struggle peek around the edges of the main street and throughout the cemetery. Yet this is not a space for the revolutionary dead. For them, one must travel to the political burial grounds in Santa Clara or, more importantly, to the space that physically ties the 1959 to the 1898 revolutions, the Santa Ifigenia Cemetery, in Santiago de Cuba, where Martí and Fidel Castro rest. Indeed, one can tell a lot about a society by how, where, and in what order it disposes of its dead. The Colón Cemetery is a monument to a bygone age—by now, the highest levels of the political elite have moved on. But it remains a living space, as lively as the society around it, organized around race, ethnicity and social position even as the ruling ideology seeks to move in other directions. While the physical remains of colonial grandeur are restored, revolutionary history is taking a backseat. The Chinese Cemetery, a few blocks away from the Colón, stands as a symbol of this decline. Many of those buried in the Chinese cemetery are veterans of Cuba’s War of Independence and the 1959 Revolutionary struggle. Yet, the facility’s disrepair is significant. Currently, a significant number of remains have been moved to a bunker underground, to protect them from grave robbers; it is certainly cheaper to do that than to repair the tombs and hire security. The Chinese cemetery is as dead as the Colón is a living space for the dead. In stark contrast to the Colón, at the Chinese there are no entrance fees and no walking tours are offered to the occasional visitors. The day that our group went, the caretaker, not used to groups, was surprised at our interest. A tour through the graveyard, however, clearly shows the important role played by Chinese immigrants in the making of the independent, and later revolutionary, Cuban nation. Yet, their heroic actions are hardly recognized. This silence is another instance of the gap between the bygone revolutionary ideals and today’s society. What do these two cemeteries tell us about Cuba today? The Colon Cemetery, where the intellectual fathers of the nation, from Fernando Ortiz to Nicolás Guillén, rest side by side with families whose financial fortunes propelled Cuban independence, is a center of pilgrimage for Cubans and foreign visitors alike. Yet, they celebrate the grandeur of a stratified society, whose wealth was expressed through ostentatious pantheons and sculptures, and whose organization was geared to ensure that the dead knew their place—along racial, ethnic, and status hierarchies. The 1959 Revolution placed class struggle at the center of the new order. Yet the Colón-Chinese Cemetery axis might cause one to ask—to what extent is it still necessary to know one’s place in life, and how will that be reflected in death. All images by Larry Catá Backer.